The earth is said to be a planet of water and 70% of the earth surface is water(Ocean). However, the basic production of phytoplankton and seaweed by photosynthesis in the sea are carried out in a very small area. Aquatic plants such as seaweed that requires sunlight for photosynthesis, only grows on the shallow parts of the sea where they can be reached by sunlight. With the photosynthetic plants as seaweed beds, fishes will lay their eggs in this area making it their habitat. However, this shallow area of 50 meters water depth(flats, islands, beach) is only 0.6% of the total ocean area. The base production of the ocean is made in these shallow areas, if the environment on these areas will get worse, the basic production of the sea will significantly decrease. Moreover, most of us live near these shallow areas, the coast where we greatly benefit from the sea from fishing and enjoying living close to it, giving us an abundant life. 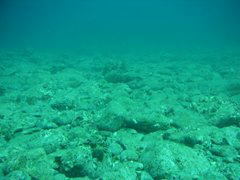 This shallow areas are important as the basic production area of the sea and for us as well as human beings. However, with the rapid economic development and industrial activity in the recent years, the shallow areas of the ocean has paid the price, environmental destruction has progressed and seaweed beds has dramatically decreased. 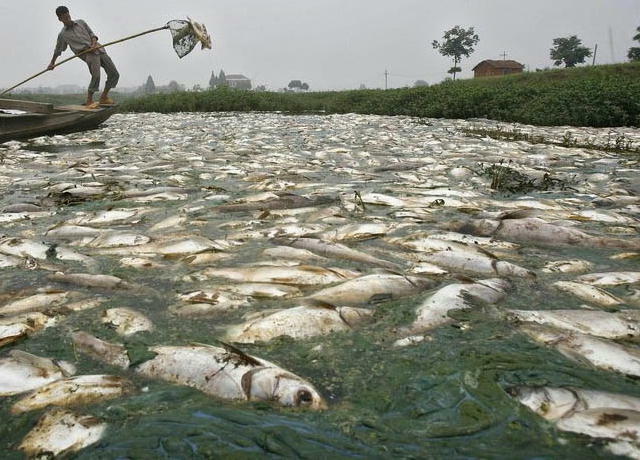 The poor marine environment water pollution is caused by the rapid growth of the developing countries in the 20th century and is now heading for improvements except for sudden accidents. However, since all drainage eventually flows out in to the ocean, the root of the problem has not been solved. 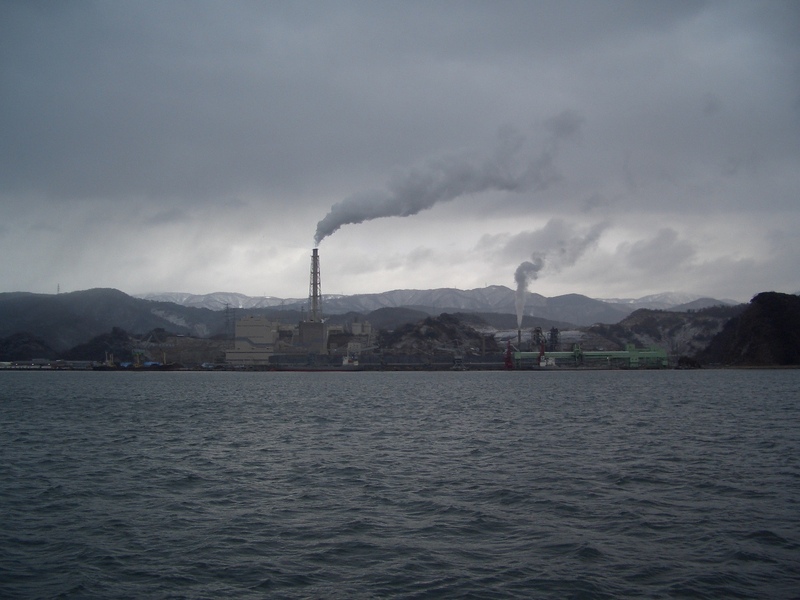 Also, in developing countries such as Asia and Africa, the economic development has been remarkable along with the increase of pollutant discharge from the industries, the global water pollution is increasing. In the coastal areas, landfill and dredging constructions are continously being performed for urban development and disaster prevention, with these many artificial structures were built quickly on the coastal urban areas. 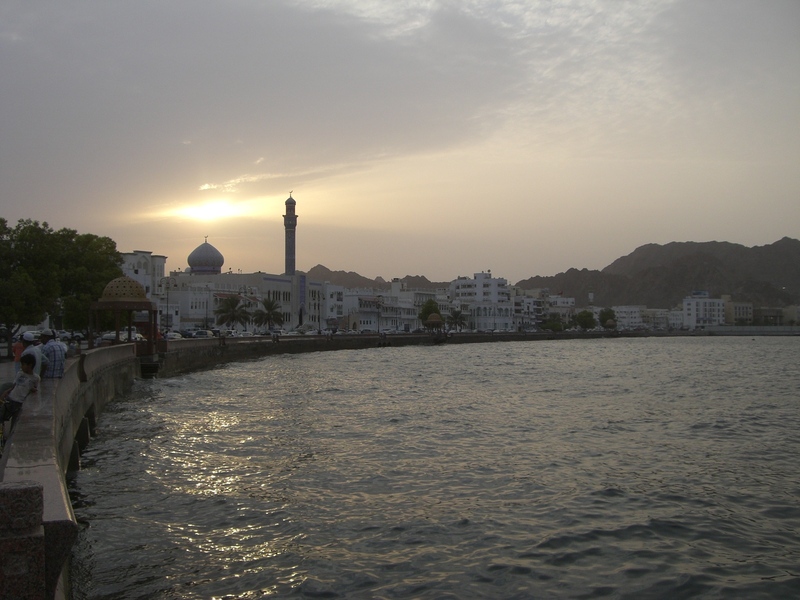 The remaining areas that were not used for urban development are used as fishing grounds on the inner bays but it is also in the state of environmental detoriation due to overcrowded culture farms and its likes. 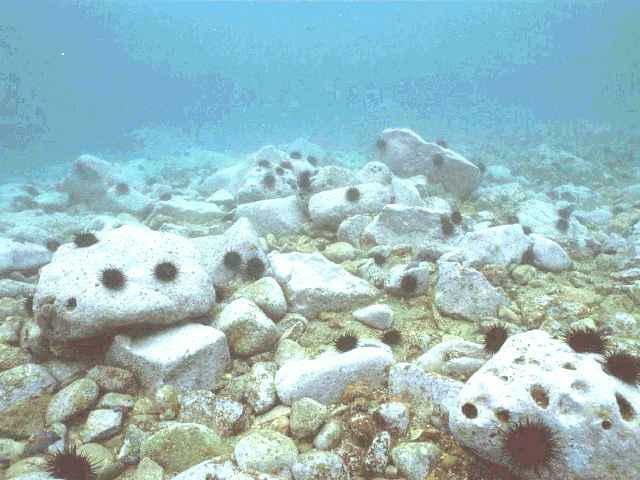 It is now in the state called "sea desert" where the former good fishing grounds have dried up with dead seaweeds, drastically reducing its habitants such as abalone, sea urchin, fishes and its eggs. Meanwhile, from our abundant lifestyle, large amounts of nitrogen and phosphorus is continually being discharged in the ocean and it destroys the ecological balance of the sea. 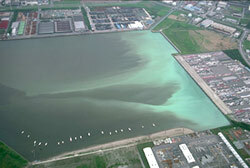 Eutrophication phenomenon has occurred causing "red tide" whereas the phytoplankton growth is tremendous. Furthermore, when the ocean floors becomes in a state without oxygen, it will form a water mass with extremely low oxygen content and when it goes to the surface of the water during summer seasons, "blue tide" will occur. Eutrophication will lead to mass generation of strafish and jelly fish that will damage the seaweeds and corals, the occurrence of red tide and blue tide will further destroy the shallow areas of the ocean, enlarges the "sea desert". The growth of seaweed is required for rich brackish-water region where fresh water and sea water mix up. Supplying minerals such as iron from inner area is important for the growth of seaweed. In Mountains in inner land area, fallen leaves become leaf soils and lands contains minerals such as iron. Rain water wash the surface of mountain and the water penetrate under the ground which gradually goes to rivers. Thus, the water countais lots of minerals such as iron, and finally goes to the ocean. The seaweed in brackish-water region absorbs the wate and gorws. However, due to urban development in inner land, dams have been constructed in rivers area as well as there were several construction in rivers. As the result, most minerals form lands tend not to be discharged to the ocean. Moreover, forests which is the source of mineral have not been taken cared due to the reduction of forest industory. 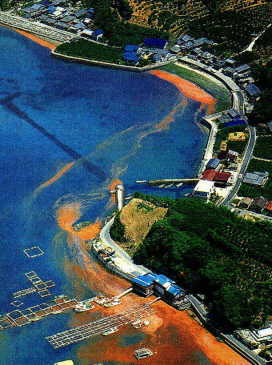 Mineral iron contained in forests are not supplied to ocean, and that causes not to grow seaweed. Thus, sea deseart emerges in everywhere. 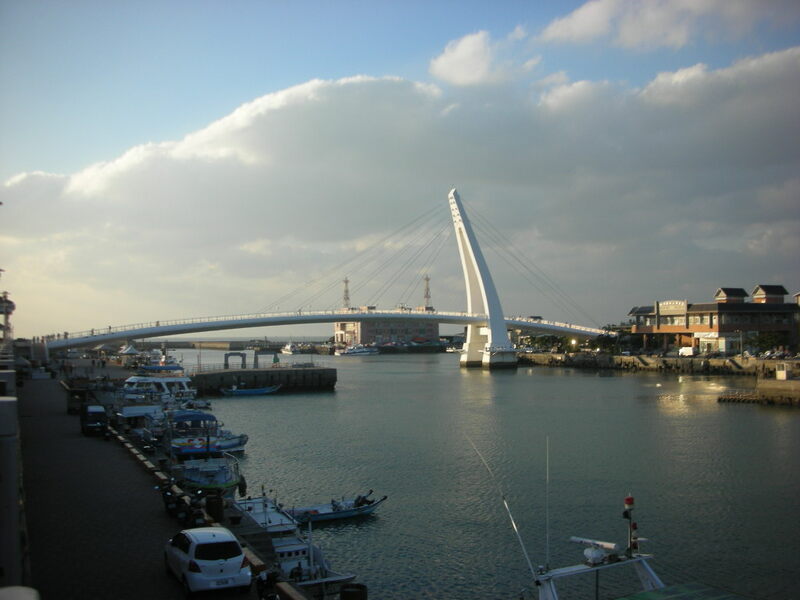 In developed countries such as Japan, point source loads from specific area decreased due to sewage construction and development of wastewater treawtment technology. Thus, water pollution due to organic matters and chemical substances has been improved. However, non-point loads from waste gas and agriculutral wastewater doesn't decrease, and the waste amount of nitrogen and phosphorous increases. On the other hand, in developing countries where has rapidly ecnomically developed, treatment plants are not constructed yet due to large amount of industrial production and improvement of life environment. Thus, lots of contaminated matters are discharged without treatment. 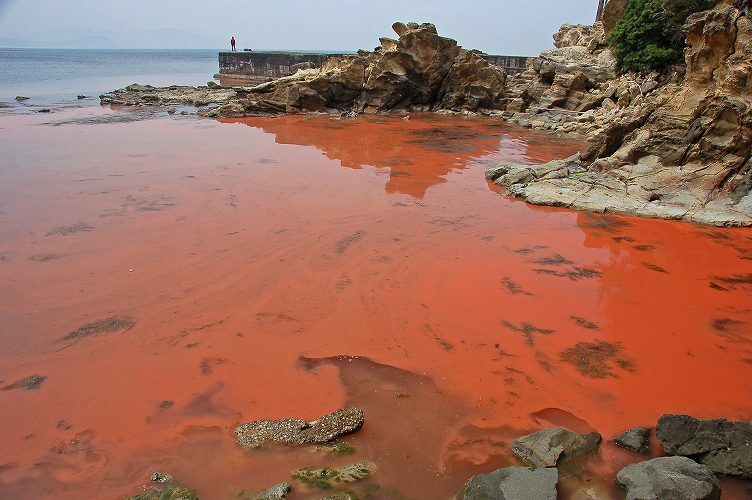 Nutrient salts such as nitrogen and phosphorous are discharged from rivers to ocean, and brackish-water area becomes nutrient enrichment, and overgrowth of phytoplankton leads "red tide." When large amount of phytoplankton due to red tide dead and deposits in the bottom of the ocean, large amount of oxygen are used to decompose these matters. As a result, the bottomo of ocean becomes lack of oxygen. Also, due to filling the land and dredging for construction for large ship lines, there are large holes in the bottom. In such holes, sea water doesn't move and it becomes lack of oxygen. Such lack of oxygen water contains hydrogen sulfide. When hydrogen sulfide reacts with oxygen in the surface of ocean, emerald green "blue tide" emerges. Seaweed which supports primary production on the ocean conducts photonic synthesis. 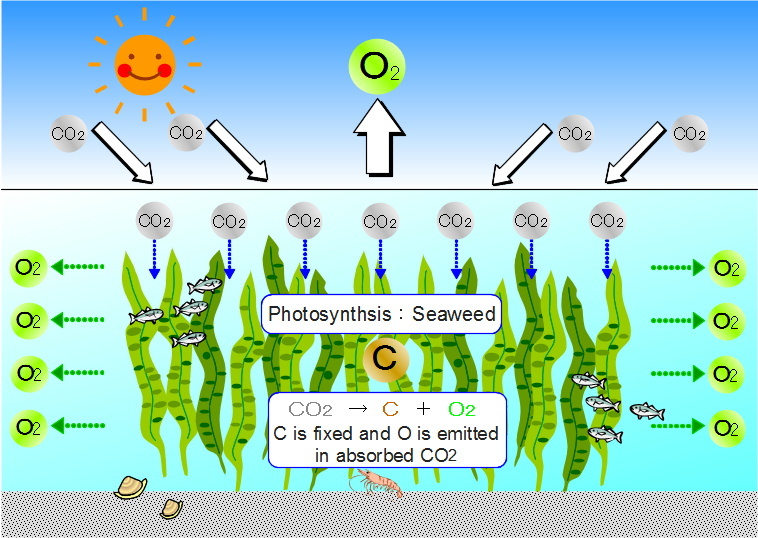 In photonic synthesis, seaweed absorbs CO2 and releases O2. CO2 is the factor of global warming and it has been claimed to reduce CO2. If seaweed grows and actively conducts photonic synthesis, it is very effective method to prevent global warming by absorbing CO2. On the other hand, if seaweeds reduces, CO2 doesn't decreases, thus speeding up global warming. Primary production in the ocean is equally important in rainforest. 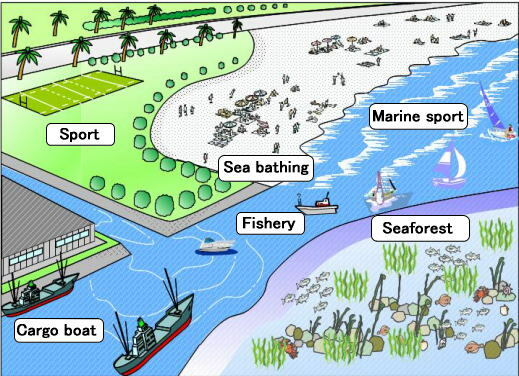 Therefore, Conserving wetland environment where seaweed grows is neccessary for the prevention of global warming. Making sea forest contributes to not only ocean environment improvement but also prevention of global warming.